Wedgie's wonderful world: Lets get cute! Happy Saturday! I hope you are keeping well and have had a lovely week. I am so proud of those macaroons! Anyway, enough afternoon tea chat...I'm here today with the fab new challenge from Sweet Stampin! This week we have a lovely theme for you.....we want to see your CUTE creations! 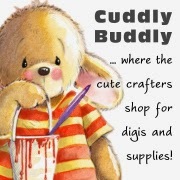 I decided to explore the Cuddly Buddly website for an image for this challenge. Cuddly Buddly is our monthly sponsor, offering our monthly winner a fab £10 voucher to spend.....and I know you'll spend it really easily! Isn't he wonderful? The image and the sentiment are actually two different images from Cuddly Buddly that I have printed, coloured and stuck together. 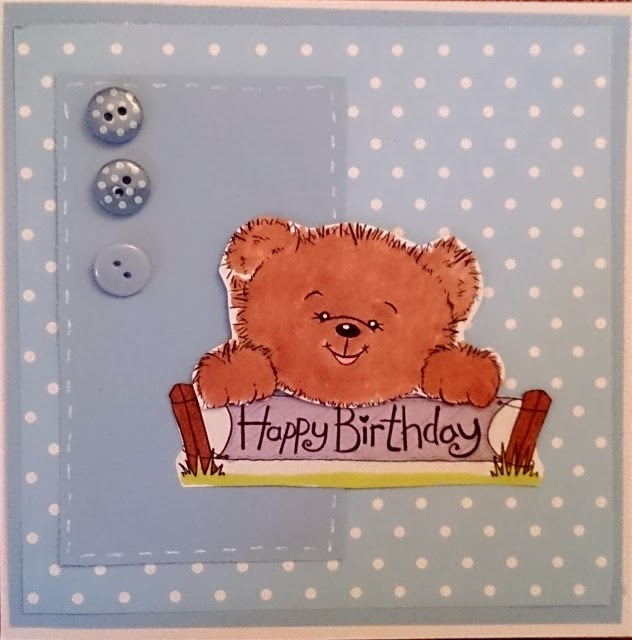 The sentiment is stuck flat to the card, and the teddy bear is stuck on with 3D sticky pads. Both the sentiment and image are coloured with my Promarkers. I then decided to go with a blue background.....full of polka dots and three cute buttons! Aww, so cute! I love the soft blues too.